The Herschel Science Team has as its overall objective (as stated in the Science Management Plan) to safeguard the scientific interests of the Herschel mission. The Science Team was formed in 1998, the first meeting was held in December 1998. Its composition is derived from ESA, the instrument consortia, and a number of Mision Scientists representing the astronomical community `at large'. In 2001 the Herschel Optical System Scientist was added. It is chaired by the Herschel Project Scientist. 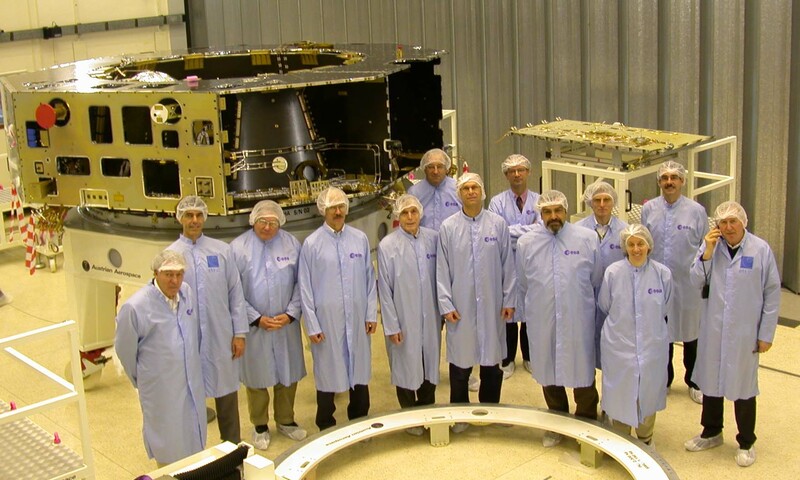 During Herschel Science Team meeting#22 on 27 April 2005 the meeting went to see the Herschel service module (SVM) structural thermal model (STM) in the ESTEC Test Centre where it had arrived just a few days before. In the picture, from left to right: Tom Phillips, Hal Yorke, Pierre Encrenaz, Paul Harvey, Martin Harwit, Matt Griffin, Göran Pilbratt, Christoffel Waelkens, José Cernicharo, Albrecht Poglitsch, Jackie Fischer, Peter Barthel, and Thijs de Graauw. Missing in the picture Gerry Crone and Laurent Vigroux.